Minneapolis is—and has always been—a city of immigrants. Today over 457,000 foreign-born individuals reside in Minnesota, 79 percent of whom live in the Twin City region. But lying behind the computed statistics and sweeping labels are the individual faces of immigration: the women and men who bring culture and innovation to our city, and the challenges, sacrifices, and triumphs they experience each day. The past, present, and future narratives of Minneapolis are written by immigrants—it’s time for their own stories to be told. Our stories are essential to building a resilient and robust free press. How do narratives in the news shape our understanding of specific issues? What do media makers consider when they present stories of lived experience? What can journalism do to elevate unheard and endangered voices? These ideas were addressed in the panel discussion “Our Stories: Our News: A Conversation About the Power of Story,” which took place on Saturday March 3, 2018, from 11:30–12:30pm at Hennepin County’s East Lake Library. 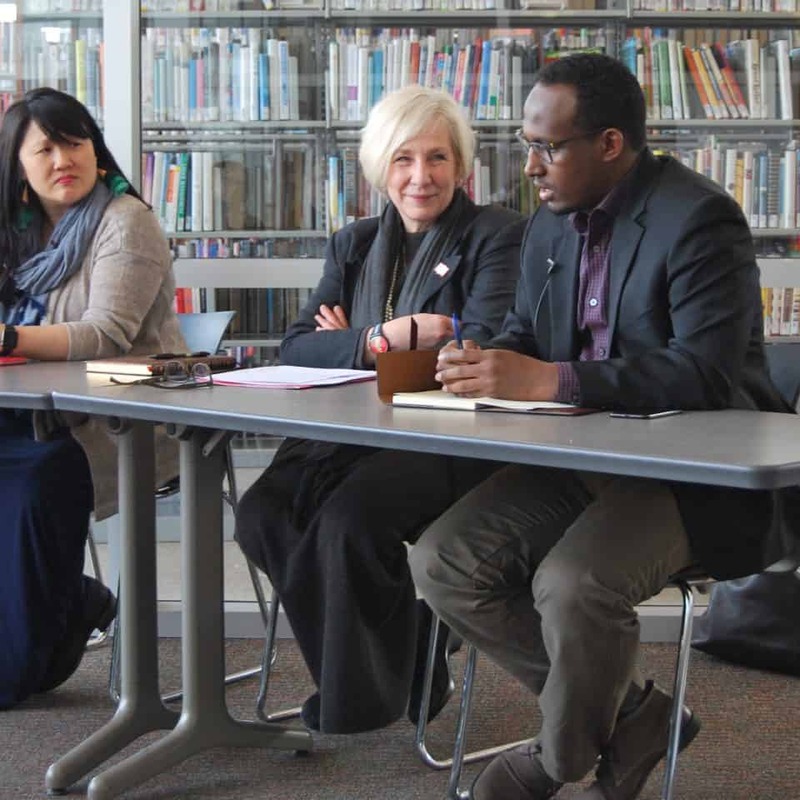 Panelists were MPR Reporter Mukhtar M. Ibrahim and Poet Sun Yung Shin. The panel was moderated by journalist and novelist Dr. Nicole Mary Milligan (N.M.Kelby), who is the founding partner of The Poetics of Forgiveness Project. 신 선 영 Sun Yung Shin was born in Seoul, Korea, during 박 정 희 Park Chung-hee’s military dictatorship, and grew up in the Chicago area. She is the editor of the best-selling anthology A Good Time for the Truth: Race in Minnesota; author of poetry collections Unbearable Splendor (finalist for the 2017 PEN USA Literary Award for Poetry, winner of the 2016 Minnesota Book Award for poetry), Rough, and Savage, and Skirt Full of Black (winner of the 2007 Asian American Literary Award for poetry); coeditor of Outsiders Within: Writing on Transracial Adoption; and author of bilingual illustrated book for children Cooper’s Lesson. She lives in Minneapolis. Mukhtar M. Ibrahim is a reporter for Minnesota Public Radio who covers the local United States attorney’s office and the FBI. He has extensively covered domestic and international terrorism-related issues, including a controversial anti-terrorism program in Kenya which was part of the U.S. government’s “soft power” strategy to combat radicalization in East Africa. Since joining MPR, he has covered a wide variety of assignments, including breaking news, enterprise, daily news, profiles, and live blogging. He has also written about immigration and stories of young Somali-Americans from Minnesota who either traveled to Syria or were charged with a conspiracy to join terrorist groups. Mukhtar previously worked as a contributing digital reporter for MPR and as a freelance journalist. His work has appeared on BuzzFeed News, the St. Paul Pioneer Press, Al Jazeera English, and the Wisconsin Center for Investigative Journalism, where he worked as investigative reporting fellow. He’s the founder of Sahan Journal, an independent source of information for East Africans and Somalis in the diaspora. This conversation launched The Lake of Dreams, a public art installation celebrating the stories of the immigrants. The event features art from the project and the installation Remembrance, a series of paper boats moored with pencils that invites the public to write down what they would like to be remembered for. 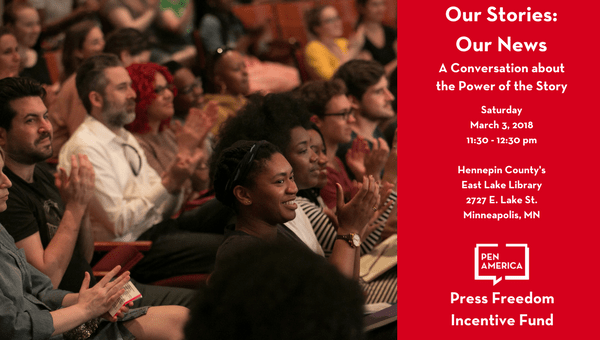 The panel discussion was made possible through a grant from PEN America’s Press Freedom Incentive Fund, which supports projects that underscore the vitality of journalism through the impact it has on a range of local issues.